This grand-daddy of all molecular models does have some interesting features. The most obvious is that the carbon atom at the centre is square planar (tetrahedral carbon was still 14 years in the future). What HAS survived to the present day is the colour scheme used (black=carbon, white=hydrogen, and not shown here, red=oxygen, blue=nitrogen, green=chlorine). But another noteworthy aspect is the relative size of the white hydrogen, which is larger than the black carbon. 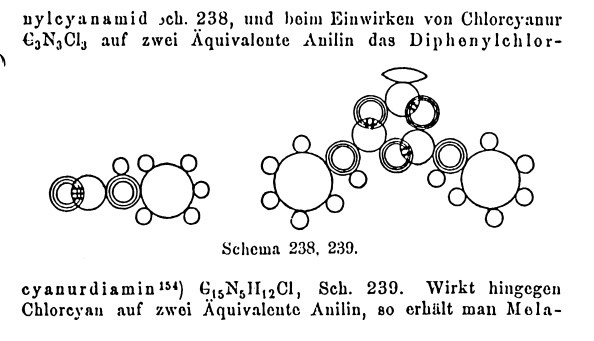 This deficiency was however very soon rectified in 1861 by Josef Loschmidt, who published a famous pamphlet in which he set out his ideas for the structures of more than 270 molecules (many of which by the way were cyclic, and this some four years before Kekule’s dream!). An example (#239) is shown below, which gets the relative sizes of the atoms more or less correct (OK, chlorine is shown with rather an odd shape). To get an idea of how good Loschmidt’s model actually was, click on the diagram to load a modern model, and compare the two! Even more impressive, these diagrams pre-date van der Waals work on the finite sizes of atoms, first presented in 1873. To conclude, I cannot resist showing one more model. Hermann Sachse believed cyclohexane could not be planar. To try to convince people, in 1890 he included a “flat-packed” model in the pages of a journal article, evidently believing that people would cut it out, and assemble it into a 3D shape. You might have noticed a theme in the present blog of presenting 3D models for many of the molecules I discuss (include the Loschmidt one above). For the historians amongst you, I note our 1995 article in which we updated Sachse’s origami with an article featuring how to incorporate interactive models into journals (still sadly only too rare). 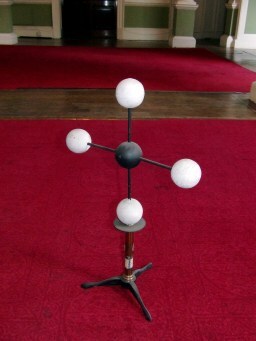 Perhaps a history of the molecular model, and how it has been presented over 150 years might be an interesting one to trace! This entry was posted on Saturday, February 5th, 2011 at 3:57 pm and is filed under General. You can follow any responses to this entry through the RSS 2.0 feed. You can leave a response, or trackback from your own site. The date of Hofmann’s lecture was 7th April, 1865, where he is supposed to have told the audience: I will on this occasion, with your permission, select my illustrations from the most delightful game of croquet … Let the croquet balls represent our atoms, and let us distinguish the atoms of different elements by different colours. The white balls are hydrogen, the green ones chlorine atoms; the atoms of fiery oxygen are red, those of nitrogen blue; the carbon atoms, lastly, are naturally represented by black balls.